Please click on a topic in the list to jump right to your most pressing questions or You can just read the entire article. These techniques are designed to make sure that you conform to the best pool maintenance standards on a regular basis. Irrespective of the materials that are used in its construction or the design, lack of proper pool care procedures not only reduces the life of the pool but as well puts the life of users at risk. Every pool requires adequate and extensive cleaning. This is done to remove any dropped leaves, debris, silt that may be accumulating within the pool over time, and ensure you maintain the water quality and keep the pool as clean and safe as possible. The kind of dirt you need to clean. You can opt to clean the pool by yourself or hire cleaning services. Performing the process on your own is more cost effective, but it will require setting aside enough time to complete the process. Hiring professional cleaners, on the other hand, will save you time but involve costs. Using robotic pool cleaners is among the new cleaning solutions. These robotic pool cleaners are a little on the expensive side but are well worth the investment when it comes to saving you time and energy. Robotic pool cleaners can be a fast, efficient and cost-effective way to take care of the pool. Pool water develops algae and bacteria when left for some time. To get rid of this, you should sanitize the pool by use of chlorine. A simple pool maintenance process, that should not require technical assistance from a professional and easy to carry out for your residential installation. The common application is the installation of a salt chlorinator, which produces chlorine in the pool. Adding chlorine manually can also help with the problem of using the chemical liquid feeder. The chemical feeder is an automatic pool cleaner installation, which adds chlorine automatically without requiring your intervention. This is an excellent option, as it provides you with ease of using the pool without having to worry about the best time to add chlorine. Other than sanitization, it is important to ensure the chemical balance in your pool is maintained at the right levels. There are three main chemicals required in your pool they include the pH at 68%, total alkalinity at 16% and calcium hardness at 16%. Regular usage of the pool and rainwater are among key factors that affect chemical balance in the pool. As a result, it is imperative to check your pool’s chemical balance at least once every week. Schools and hotel pools may require this process almost daily, taking into consideration the high number of users who visit such pools. Wear and tear is a common occurrence in pools. When the pool is left unattended for extended periods, wear and tear may result in breakages and a risk to the users. It is for this reason that regular checks should be undertaken. A qualified technician with the capacity to identify any cracks or damages to the surface should do this to determine if there are any cracks or leaks that might be developing on the pool surfaces and recommend the best repair solutions. You can also undertake these checks during the cleaning processes. It means that the process needs to be undertaken cautiously to ensure any developing cracks are detected. When found, assistance from qualified technicians should be sought to ensure only the right and befitting repairs are done. As an important pool care initiative, always ensure this is a regular activity, as this gives a chance to avoid extensive damages. At certain times of the year, there are chances of the climate getting extremely cold. During such times, the cold water that makes it difficult for family members to enjoy the swimming in the pool limits usage of your pool. It is for this reason that it is important to ensure there is a pool heater installed. Different types of heaters are available including solar heaters and thermal heaters. Alongside installing a heater, it is important to have a solar or thermal blanket installed within the pool. The blanket is ideal to ensure that once heating, heat is maintained through the night, as well as, avoid evaporation. The recommended heat level for pool water is at 77 degrees Fahrenheit to ensure comfortable swimming; this is for all individuals irrespective of age. Erecting a fence all around the area where the pool has been installed is not only a great Pool Care idea But in some places, it’s a law. Preventing a child from drowning is of the utmost importance. Sometimes animals in the neighborhood can also easily stray into the pool area, causing damage and possibly loss of life. 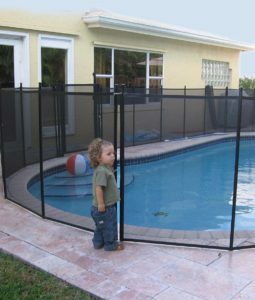 To avoid these types of incidents, it is important to ensure there is a fence around the pool. Installing filters within the pool is an important maintenance practice. It ensures the water entering the pool is filtered of particles that would eventually turn to dirt. The dirt filtered has the potential to promote algae growth, thus, it is important to ensure the filters are cleaned regularly. The process should be done at least once in a week and where possible robotic pool cleaners can be programmed to undertake the process regularly. Evaporation, wear and tear leakages and splashing the water while swimming reduces the water amount in the pool. To ensure the water levels are maintained above the skimmer is important to prevent damage to the pipes. Checking on and adding to the water levels regularly is an important pool care practice that ensures the pipes, walls and floor are also not exposed to extreme weather conditions that might lead to corrosive exposure. After swimming season is over or while undertaking cleaning exercises, it is common to remove the water from the pool. It is a safety pool maintenance practice. However, the pool should not be left without water for extended periods. Water in the pool counteracts with ground forces and if left exposed has the potential to destroy the walls and the floor of the pool. During the winter season, water in the pipes also freezes. When this happens, it increases the risk of causing damage to the pipes. It is important to drain water from pipes during such season. It can be done easily by blowing the water. It is important to ensure the heaters, pumps and chemical feeders are removed, cleaned and stored when the pool is no longer in use, this is owing to such effects as weather. During the season, it is advisable to super chlorinate, as there are chances of taking longer before inspecting the pool. During the season when the pool is not in use, it is important to ensure it is covered fully. This is an important step, as it helps keep out debris and other dirt from entering the pool. Covering the pool also helps reduce the rate of evaporation and in such way ensuring the water levels are maintained at the required levels. Covering the pool helps in keeping stray animals and children from the pool. When covered, growth rate and development of algae and other investing materials are also reduced significantly and this an ideal pool care practice that helps keep it safer and cleaner. The area that is around the pool is as important as the heated pool itself. Ensuring the area is clean at all times is an important factor that helps keep contaminants away. This should include maintaining grass, bushes, and fences around the pool short. With a clean area around the pool, it becomes noticeable from a distance. In such way, it is easy to monitor any intrusion, as well as, help keep visitors children and stray animals from getting close to the pool without being noticed. After being unused for a period, it is important to create an opening practice as part of pool care exercise. This includes undertaking extensive cleaning, inspection for faults, automatic pool cleaners, and chemical levels. These measures should be undertaken and faults that you have identified should be rectified before the pool is put into use. Before the pool is safe to use, it will take up the better part of a whole week through which the pool opening processes are undertaken. During the week, you will make sure that all of the pool maintenance measures are put in place for safety standards as well as giving adequate time to monitor any changes that may have occurred when the pool was not in use. A pool is an important and sometimes very expensive addition to the home. It offers the family a recreational facility not to mention being an enhancement to the value of the home. So, it just makes sense that you would ensure that an aggressive pool care, pool maintenance program is in effect. Having in place adequate pool maintenance procedures is an important aspect of pool care that ensures the reasons for which the pool was installed are fully met. Most of the Pool maintenance practices are easy to perform activities and therefore always ensures the maintenance cost is considerably low. They are all important despite the fact they might vary with different types of pool installations. I love the picture of you sitting by the pool! Fabulous!